That small bony protrusion behind your ear is the mastoid process. 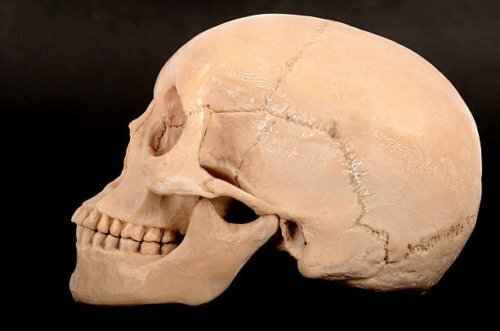 As one of the 22 skull bones, this bone behind the ear is the connection point for major neck and head muscles, nerves, and tissues. With the mastoid process location being close to the ear, any infection of the ear or blow to this region of the head may damage this vital bone. We will look at the workings of this tiny portion of the skull. The mastoid process anatomy comprises complex structures. It is located behind the ear, and is known as the C1 bone of the spinal vertebral level. The mastoid process bone itself is in the shape of a pyramid that projects behind the temporal bone. The temporal bone is located at either side of the skull beneath the temple. The upper portion of the mastoid process meets with the parietal bone, which curves to form a segment of the side and the top of the head. This bone behind the ear also forms a joint with the trapezoid-shaped occipital bone at the posterior lower portion of the cranium. It continues to join with the lower section of the squamous area of the temporal bone at the front. The squamous is the portion of the temporal bone that is flattened and is part of the skull’s side. Between the front upper section of the temporal bone, or the squama, and the petrous, a pyramid-shaped bone at skull base, is the cranial suture known as the petrosquamous suture. This suture continues to the top portion of the mastoid process. Within the mastoid process, there are air cells of various shapes and sizes. Near the larger frontal portion of the mastoid, these air cells contain air, whereas the air cells at the tip of the mastoid have marrow. 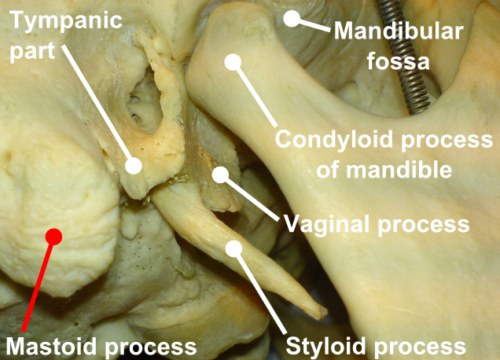 Males tend to have a larger protrusion of the mastoid bone than females. This may be because of the bigger mass of muscles in males, as the mastoid process is not noticeable at birth. It grows at the age of two years, once the head and neck mobility muscles are developed. An interesting but morbid function of the mastoid process is as a commonly used indicator in identifying the gender of an unrecognizable body. Splenius capitis: Located in the back of the neck, it helps the erection of the head as well as extension, side-to-side movement, and rotation of the head and neck to one side. Longissimus capitis: It allows rotation reflex of head to one side, and is part of the intermediate column of the muscle group sacrospinalis that runs along the neck and back. Sternocleidomastoid: This muscle is on either side of the neck, and is responsible for bending the head forward and to the side, moving the head to either side, and maintaining stability of the head. Digastric posterior belly: This muscle is under jawline within the suprahyoid muscle group; one of the two digastric belly muscles, it forces the mouth open when it contracts and promotes the action of swallowing. Internal and exterior sources can damage the surrounding tissues and bone, resulting in one of the following mastoid process diseases and conditions. With an ear infection, if the virus invades the mastoid cells, a condition known as mastoiditis may develop. The infection causes severe mastoid process pain and inflammation in the ear. It may also cause reddening of the skin, headaches, and partial hearing loss. The mastoid process may also be affected by physical trauma to the head. Injury to the temporal and mastoid bones is detected by diagnostic imaging tests. It may result in mild bruising or fracture to the bones. A tumor on the mastoid process is rare but may occur as a result of radiotherapy, hormonal imbalances, chronic infection, trauma, or as a post-surgery complication. This is a benign bone or tissue tumor, usually with no symptoms. In a few cases, disfigurement of the ear may be seen or obstruction symptoms of pain and hearing loss. Another section of the region behind the ear contains the mastoid process lymph nodes. Known as the retroauricular lymph nodes or posterior auricular glands, these are located on the sternocleidomastoid muscle, which lies under the posterior auricular muscle. The function of the mastoid process lymph node is to transfer the protective lymph fluid to the superior deep cervical node. These nodes filter harmful bacteria and viruses as the fluid passes from the posterior temporoparietal junction of the brain (where the temporal and parietal lobes meet), the cranial upper portion of the ear, and from back of the ear canal. Mastoid process location is often used for the Rinne test, which detects the type of hearing loss with use of a vibrating tuning fork. Facial paralysis from an injured mastoid process occurs as the facial nerve supplies the region of the mastoid process. Mastoid pain can be stimulated by using the wrong vision prescription. With the attachment of the mastoid process to the neck tendons, earaches may develop following injury or infection of the bone. The protrusion of the bone is one of the markers used in martial arts as a detrimental target for generating pain in an opponent. Mastoid process is a bone behind the ear that appears in a protruding cone-shape pyramid. It is responsible for the attachment of the neck muscles. These muscles allow for movement of the neck and head such as rotation. The enlargement of a male’s mastoid process allows for gender recognition, if needed. This larger protrusion is possibly attributed to the natural growth of the male body. The mastoid process can become damaged by trauma or a health condition. This may cause further complications not only to the mastoid bone, but also to connecting tissues and muscles. In addition to being a key component in the mobility of the head and neck, the mastoid process is a pressure point used to gain control of an opponent in defensive fighting. Any noticeable enlargement of the mastoid process may be an indication of a serious underlying tumor or damage and should be checked by a medical professional. What Causes Cholesteatoma of the Middle Ear? “Mastoid Process,” Ken Hub; https://www.kenhub.com/en/library/anatomy/mastoid-process, last accessed October 16, 2017. Agarwal, A., “Mastoid Process,” Know Your Body, July 29, 2017; https://www.knowyourbody.net/mastoid-process.html, last accessed October 16, 2017. “Splenius Capitis”, Physiopedia; https://www.physio-pedia.com/Splenius_Capitis, last accessed October 16, 2017. “Longissimus Capitis,” Physiopedia; https://www.physio-pedia.com/Longissimus_Capitis, last accessed October 16, 2017. “Sternocleidomastoid Muscles: Affects Head, Eyes, Sinus, Ears, Throat, Pain, Dizziness, Whiplash,” The Wellness Digest; http://thewellnessdigest.com/sternocleidomastoid-muscles-affects-head-eyes-sinus-ears-throat-pain-dizziness-whiplash/, last accessed October 16, 2017. Jones, J., MD et al., “Digastric muscle,” Radiopaedia; https://radiopaedia.org/articles/digastric-muscle, last accessed October 16, 2017. Tawab, H., et al., “Osteoma Presenting as a Painless Solitary Mastoid Swelling,” Case Reports in Otolaryngology, 2015(590783); https://www.hindawi.com/journals/criot/2015/590783/, (http://dx.doi.org/10.1155/2015/590783), last accessed October 16, 2017. “Mastoid lymph nodes”, Wikipedia; https://en.wikipedia.org/wiki/Mastoid_lymph_nodes, last accessed October 16, 2017. Roßkopf, R.N., File: Processus styloideus (close).png) [<a href=”https://creativecommons.org/licenses/by-sa/2.0/de/deed.en”>CC BY-SA 2.0 de</a>], <a href=”https://commons.wikimedia.org/wiki/File%3AMastoid_process_(close)_with_label.png”>via Wikimedia Commons</a>, last accessed October 16, 2017.